Following the very low temperatures during the winters of 2013-14 and 2014-15, many vineyards experienced cold damage to their grape vines. Rutgers New Jersey Center for Wine Research and Education (NJCWRE) conducted a survey of NJ vineyards in spring of 2016 to assess the degree of winter damage. A total of 26 vineyards participated in the survey, reporting damage in 60 different wine grape varieties, including, 31 vinifera, 22 hybrids, and 7 native varieties. After the 2013-14 winter, 85% of vineyards (n=24) reported winter damage, resulting in injury to grapevine trunks or cordons. 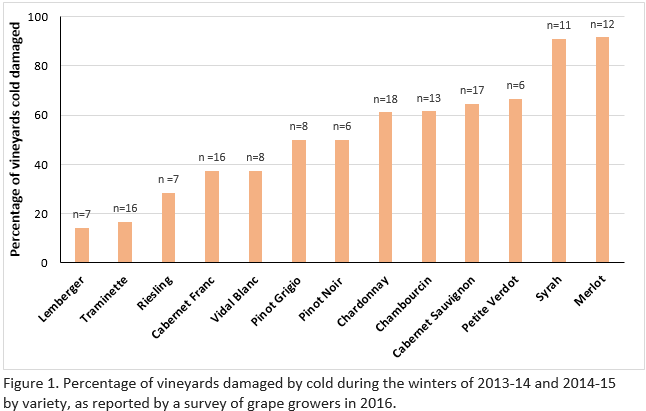 About 70% of vineyards reporting indicated that they had winter injury following the winter of 2014-15, however it is likely that some of the damage could have occurred during winter of 2013-14, but the damage only became obvious a year later (Table 1). For the purpose of this survey, damage was defined as noticeable damage to any tissue or removal of vines, following the winters. Among vinifera varieties, only Riesling and Cabernet franc suffered less than 40% damage. Pinot Grigio and Pinot noir had 50% damage while Chardonnay and Cabernet Sauvignon had about 60% damage. With more than 90% vineyards reporting damage, Merlot and Syrah were the most affected by winter injury. (Figure 1). Among Hybrids, Traminette was the least damaged variety with only 17% of Traminette vineyards reporting damage. About 37% of the vineyards growing Vidal Blanc and 62% of the vineyards growing Chambourcin, reported damage. 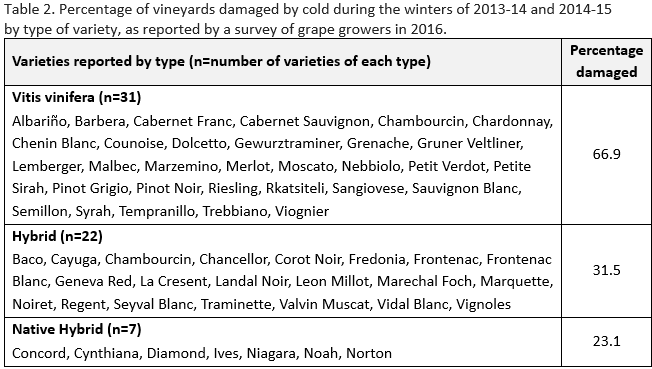 Winter damage in varieties grown at less than 6 vineyards are not presented separately in this report. Overall, native varieties, though grown at fewer vineyards reported only 23% damage while hybrid varieties reported 32% damage. Though grown in 31 vineyards, vinifera varieties reported 67% damage (Table 2).